In this post you will find code snippet to migrate your classic Azure VMs that is part of virtual networks. That is, you will learn Migrating Azure VMs on VNet from Azure Service Management (Classic or ASM) to Azure Resource Manager (Resource Manager or ARM). Without too much discussion, let's start step by step. You need to have PowerShell installed. In the process of migration you first need to sign in your subscription using modern way that is ARM to prepare migration and then sign in your same subscription using classic approach that is ASM to perform migration and commit. Now, let's prepare the migration on ARM, this operation may take few minutes. 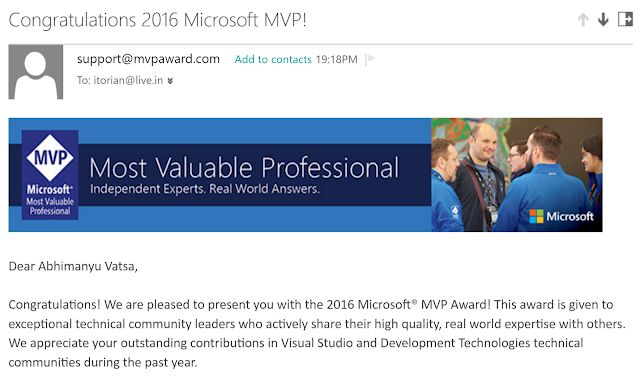 So, once again Microsoft awarded me with the MVP (Most Valuable Professional) award for the 5th time in a row in the Visual Studio and Development Technologies (earlier it was ASP.NET/IIS) category. I'm honored to be the part of Microsoft MVP Program, this is one of the most prestigious award to me. I'd like to thanks to my family, all friends, Microsoft Indian MVP Group, Biplab Paul (India MVP Program Lead), Gandharv Rawat and my blog readers and followers. A very-very special thanks to 👩 who is supporting me every day. -Credential parameter can only be used with Organization ID credentials. For more information, please refer to http://go.microsoft.com/fwlink/?linkid=331007&clcid=0x409 for more information about the difference between an organizational account and a Microsoft account. 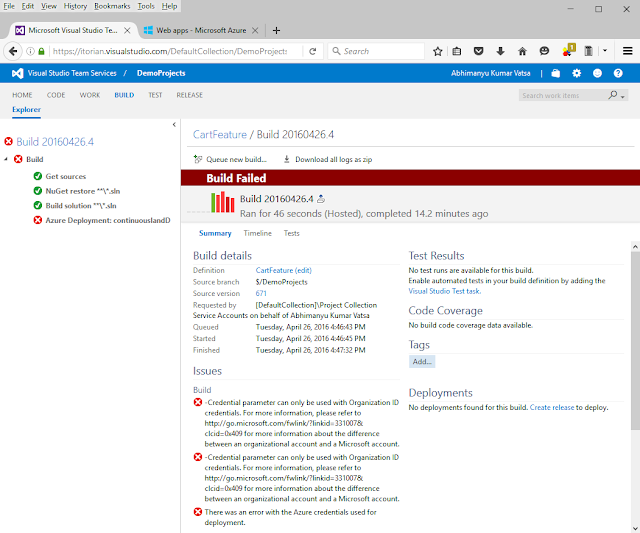 There was an error with the Azure credentials used for deployment. Edit existing build definition and select "Azure Web App Deployment" and then click on "Manage". Now you will be redirect on new tab.